The insightful research report titled “Thermal Ablation Devices Market: Global Industry Analysis (2012-2016) and Forecast (2017-2025)” by Persistence Market Research provides extensive analysis on every aspect of the market along with forecasts. This research report will give the reader an exquisite feel and flavor of the global market in a structured format with which informed decisions can be slated to stay in sync with the changing market scenario. A robust research methodology is used at Persistence Market Research to obtain valuable insights on different market segments across key regions. Secondary research followed by primary research is carried out and key opinions from market observers, thermal ablation device suppliers and manufacturers, healthcare consultants and subject matter experts is collected. This gives global market acumen which is triangulated to arrive at data points pertaining to specific segment and specific region. The research process enhances the accuracy of the market data so collated owing to revalidation and cross verification of data points at each interview level, which can be used in the execution phase. To sum up, the research process involves data collection, data filtering and analysis, research and intelligence, actionable insights to arrive at relevant business solutions. According to Persistence Market Research, the global thermal ablation devices market is anticipated to grow at a robust growth rate to reach a noteworthy market valuation by the end of the assessment period, 2017-2025. The global market for thermal ablation devices is expected to reach a valuation of about US$ 8 Bn by the end of the period of assessment from a value of around US$ 4.7 Bn in 2017. This 1.7x increase in revenue can be attributed to the high growth pace that the global market reflects. The global thermal ablation devices market is projected to grow at a high CAGR of 6.7% throughout the period of forecast. 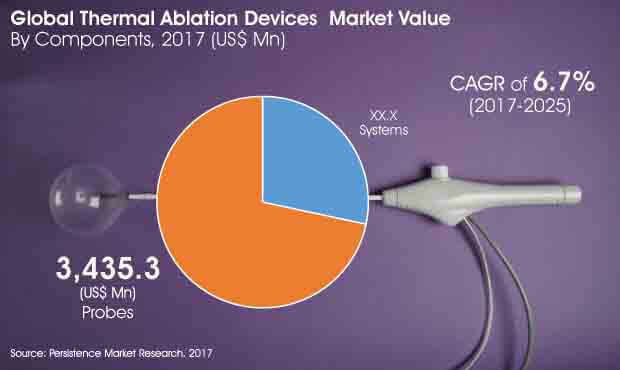 Rising demand for minimally invasive procedures such as microwave ablation, radiofrequency ablation etc., and increasing technological advancements in thermal ablation systems and catheters expanding the scope of existing products are few of the main aspects driving the growth of the global thermal ablation devices market. Probes segment by component, is expected to grow at a higher pace in the coming years. Since the use of disposable probes is increasing and each procedure requires a new probe, the market for probes is showing a higher attractiveness owing to high demand. The probes segment is projected to rise at a healthy CAGR of 6.8% during the period of forecast, 2017-2025. In 2017, this segment reflected a revenue of around US$ 2.5 Bn and is estimated to reach a value of about US$ 5.8 Bn by the end of the assessment year. The systems segment in the component category is expected to grow at a comparatively slow pace to register a CAGR of 6.3% throughout the assessment period. It is estimated to reach US$ 2.2 Bn by 2025 end from a value of about US$ 1 Bn in 2017. Thus it can be said that the probes segment is likely to lead the global market in terms of both value and growth rate in the years to come. The probes segment is further categorized into interstitial probes, grounded probes and needle applicators. Of these, the grounded probes sub category is expected to lead the market in terms of high valuation as it is estimated to reach a value of more than US$ 3 Bn by the end of the forecast period and highly contributes to the growth of the probe segment. The interstitial probes sub segment and needle applicators sub segment are also buckling up and projected to grow at a higher pace in the coming years. The needle applicators sub segment is expected to grow at the highest pace to register a CAGR of 7.8% throughout the period of assessment. The systems segment is also sub categorized into radiofrequency ablation, hydrothermal ablation, microwave ablation, laser ablation and ultrasound ablation. Microwave ablation is the largest sub category as it is poised to showcase an estimation of US$ 872 Mn by the end of the assessment year from a value of about US$ 435 Mn in 2017. The revenue of the systems segment is largely contributed by radiofrequency ablation, ultrasound ablation and laser ablation sub segments.